If you are interested in a pet bird, there are many things you need to consider before you settle on a species. Carefully considering such things as how much time you can devote to a bird and how much noise you can tolerate can help you make a good decision and find a bird that will be a good match for your personality, lifestyle, and household. Finding the right bird is essential to paving the way for a long and happy relationship with your pet bird! How much time do you have to spend with your bird on a daily basis? If you don't have a lot of time, re-think getting a single parrot (this includes cockatiels and budgies). Finches or a canary might be a better choice if you are not home much. You must also consider the commitment needed to care for your bird over its whole lifespan. Larger parrots have long expected lifespans (50 years or more) and some bond so closely with their owners that adapting to a new home can be difficult. Parrots often screech. There is no way around that, so if you live in an apartment or townhouse, a large parrot may not make you popular with your neighbors (especially very loud parrots such as cockatoos and macaws). Similarly, if you don't handle noise well, some birds may not be a good fit for you. Budgies, cockatiels, and lovebirds can be fairly noisy in their own way, but not as loud as larger parrots. Finches, doves, and canaries are better choices if noise is a concern. How much space do you have for a cage? You can't skimp on cage size; even smaller birds like finches and canaries need sizable cages because they get generally only get exercise within their cages. The larger the bird, the larger the cage that is needed. Parrots (including budgies and cockatiels) will also need time outside of the cage for extra exercise. It is good to give larger parrots a special space of their own outside the cage, such as a play gym or stand. Most species of pet parrot require a diet made up of pre-formulated diets (e.g. 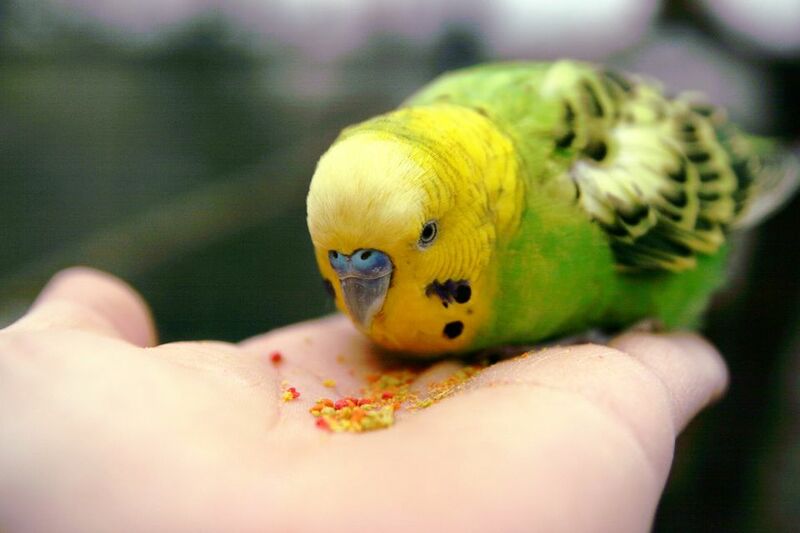 pellets), a variety of fresh foods such as greens, sprouted seeds, grains and fruits, along with some seeds (generally, the larger the parrot, the fewer seeds that should be fed). Some birds (e.g. lorries, toucans) require very specialized diets, but some (finches, canaries, doves) have less complicated dietary needs. Find out exactly what your selected species of bird requires and decide if you can provide it. How much do you want to interact with your bird? Some birds do not really take to handling (e.g. finches and canaries), while others bond very tightly to their owners and can be quite cuddly (e.g. cockatoos, some other large parrots). If you do want a bird you can interact with socially, you need to be able to commit the time to do so, as the more social birds can be very demanding of attention and resort to neurotic behavior if denied the interaction that they need. Many people choose parrots for their ability to talk. While certain species are renowned for their talking and mimicry ability, think twice if that is your motivation to get a parrot. Even within species known for speech, the ability to talk varies among individuals. However, most parrot species are intelligent and can be trained to do various tricks and behaviors. Even some of the smaller parrots can be trained to whistle tunes and can be quite entertaining.